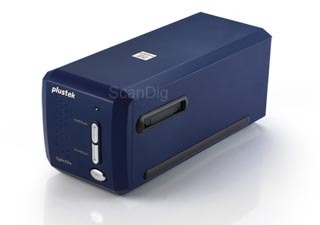 The Plustek OpticFilm 8100 - successor of the OpticFilm 7400 - is a simple scanner for simple demands. It can digitize framed 35mm slides and 35mm film strips (positives and negatives) using film holders. As you can read in our test report about the OpticFilm 8100 the device scans with a very high resolution of up to 7200 dpi; thereby one optains 3800 dpi effectively - a very high value for such a low-prize scanner. There can be inserted up to 4 mounted 35mm slides into the slide mount holder; and there can be inserted film strips up to a length of 6 frames or loose frames into the film holder. There is always only one frame scanned since the scanner does not have an automatic film transport. After each scan you have to move the film holder forward by one position in order to scan the next picture. The Plustek OpticFilm 8100 is delivered with the scan software SilverFast SE Plus from Lasersoft Imaging. Thanks to the multi exposure feature the films can be exposured twice in order to get a higher contrast. One scan takes about 10 minutes depending on the settings. Additionally there is the time for the post-processing in the image editing program, so you have to calculate about 15 minutes for one picture. The main disadvantage of the Plustek Optic Film 8100 is the missing dust and scratch removal, which is normally standard nowadays. Other film scanners in the same price category as the Reflecta CrystalScan 7200 or the Canon CanoScan 9000f have the hardware based dust and scratch removal function, which leads to significantly better scans and saves a lot of post processing time. For more information, please, read our detailed test report about this scanner. Mounted 35mm slides or negatives (5 x 5 cm, all established mount thicknesses) up to 4 pcs. One such film strip holder is already included in the delivery content of the Plustek OpticFilm film scanners. With a second film strip holder you can load it while the other one is still in the scanner. This saves time and makes scanning more efficient and comfortable. One such slide mount holder is already included in the delivery content of the Plustek OpticFilm film scanners. With a second slide holder you can load it while the other one is still in the scanner. This saves time and makes scanning more efficient and comfortable.